I have really been loving the all white look! Another guilty pleasure of mine is leather. Something about it just makes me feel dressed up and I love that feeling. I couldnt help but pick this one up due to all the detail and of course the leopard! I love leather and so I made sure to get different colored jackets to enjoy all year long. Take a look at a few of my favorites below! Thanks for stopping by. Yea, you are looking gorgeous on white look. But I have still unable to understand what do you mean “animal of us” is it possible to reply me? Thank you!! xo haha it is just a phrase. Oh! thanks for your reply. Very lovely neutral look, and very chic! you are such a Beauty. amazing! You are too nice! Thanks babe! You look amazing! Love the Outfit and the jewelry! I know right! Its one of my favs right now. THanks for stopping by Audrey! You are really really pretty and i love your outfit!! Awe so sweet! THanks TIff! 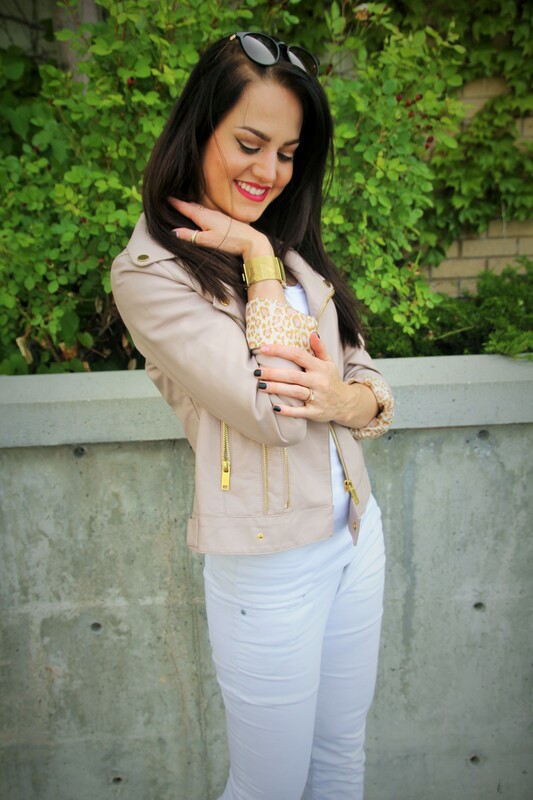 Loving the subtle animal print on your sleeves. It’s so fun! Thank you girl! me too! Loving your shoes! You know a shoe hasss to be comfy when they even look comfortable in photos! They really are! I love them. THanks for dropping by Susie! Thank you!! It is my favorite right now! You look amazing and I am loving those shoes! 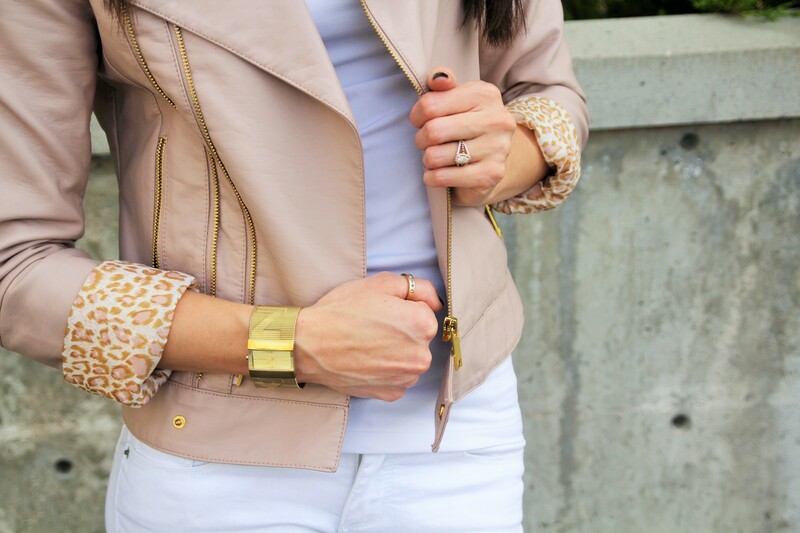 I love the color of the leather jacket and the unique leopard sleeve. What a great way to add some flair to an all white outfit. I love these white crops girl, they look SO good on you!! I just sent two pairs of white jeans back to Shop Bop because for some reason, I absolutely cannot pull them off!! Booohooo!! Latest Post: How to Wear Crazy Leggings – From the Gym to the Street! Thanks babe! I dont believe that is possible! You can pull anything off! Absolutely stunning look.Love, love the jacket. Thanks Andrea it definitely is a favorite! I know right I love it! 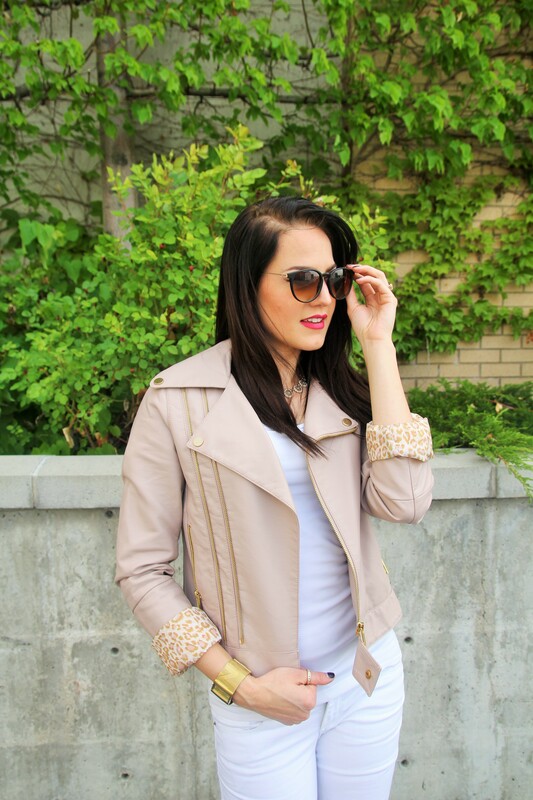 Love the pop of leopard on your jacket! You’re killin’ it in the all white too 🙂 I hope you have a great weekend you look fabulous as always! Thanks Lindsey you are the sweetest! totally loving the jacket and the booties! nice look! Hi Jness! I am so attracted to the summery style you have here! Those skinny white jeans and zippered platforms make a cool statement for a fun day in the city!! Glam rocker chic vibe! This all white look is so striking! The animal print adds just the right touch! Thanks Bry im glad you think so too! Thank you Lily that is so sweet! Thanks for stopping by! Love the details of this outfit! So so cute! I adore the jacket dear! I also love the color combi. The pieces of jewelry are stunning!